I am starting to ponder all of the many parts and pieces of a self-generated campaign setting. This got me to thinking about scale mechanics and how I wanted to represent the game world. I am a hex-crawler, so I’ve already jumped the initial hurdle of campaign map style. It may sound a bit ambitious at first, but I am going to map at a 1/2 mile scale in detailed regions and use 6-mile hexes to display the detailed portion of the game world. The 6-mile hexes upscale to 36-mile hexes which would be fine for the ‘lower resolution view’ of a campaign map. A perfectly formed 6-mile super-hex displayed at 1/2 mile per normal hex. Shexy! The goal is to use a mapping scale that is friendly to displaying the location of villages and minor terrain features such as normal-sized lakes. Really, any feature that isn’t on an epic scale could be comfortably depicted. The reason that this scale is important to me is because I plan to set the campaign in an era where human affairs are dominated primarily by loose bands of City States. Placing villages, large holdings, resource points, and other important markers onto a map scaled to handle such things is critical to accurately portraying the holdings of a given City State. City States require a network of villages to provide food production and other base resources for the dwellers of the city. In turn, the villagers trade their food, furs, and raw materials for finished products and the city state also has men at arms that protect the small villages. When war does come, the farmers flood the city seeking the protection of walls and warriors. Systems of roads, bridges, and towers might be employed by wealthier City States. Anyhow, the first task is to get the 36-mile campaign map started. I will probably focus on a smaller continent and get going on it with a larger goal of developing a map reference system, semi-random map generation tables, and to generally get in the thick of just doing it so I can better see how I want to proceed. So the initial goal is to build the lower level tools that I will need to build the maps. 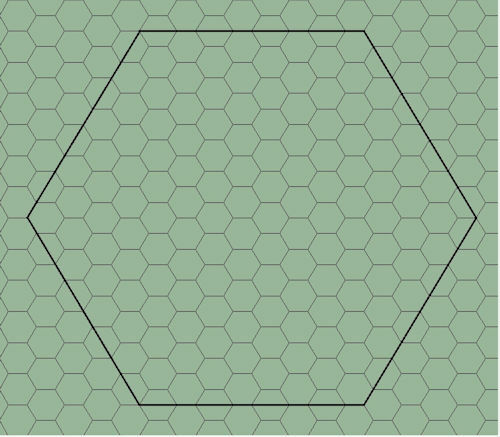 Default hex-grid templates and a coordinate or reference system seems like a good place to start.